MD had his fun, now's my time. I got my hands on several pounds of Warminster floor-malted Maris Otter. 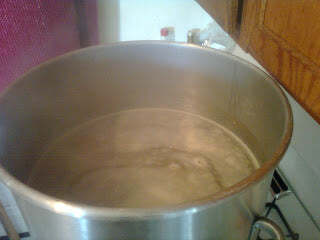 Stirring the mash down to 149°F in my 70 qt. Igloo cooler. Sitting material for midbrew convalescence. 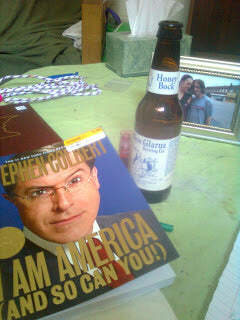 I needed Colbert to purge the British influence from my red American blood. 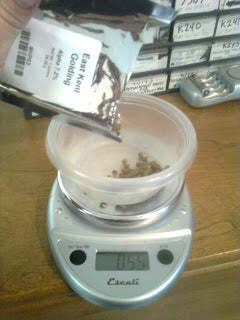 One ounce of Kent Goldings pellets goes into the boil. 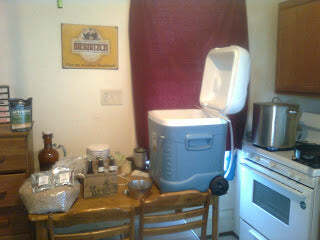 The count was seven gallons of wort, pre-boil; 9° brix SG. Dividing the last ounce of pellets for the final two hop additions. Half ounce at 20 minutes, the other half at flameout. OG after chilling came to 12° Brix. Wort color was an understated red. 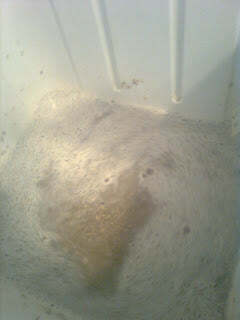 I pitched a smack pack of Y1968, London ESB, my favorite for fast fermentations. The wort boiled a nutty character throughout, with hops smelling racy spicy! In a week I'll likely be bottling half the batch, having recently found my lost red baron capper. As part of the terms of experimentation, I'll have to bring samples to the warehouse. Update:It's what, three weeks since brewing? I was in a bind to find time for bottling, so the bitter be kegged. Tastes a bit sweeter than my expectations, but the Kent Goldings flavor is nice.